This book is no longer in stock at our Canadian or American distributors. 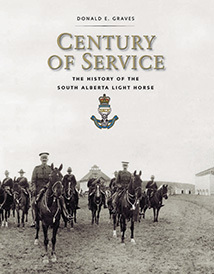 Remaining stock is now held by the South Alberta LIght Horse Regiment Foundation. There are still copies in stock at our distributor for the UK and Europe, Gazelle Book Services. In those markets the book may be bought directly from Gazelle or from bookstores. The book can also be ordered from the South Alberta Light Horse Foundation www.salh.net. Century of Service is the colourful story of Alberta’s senior militia regiment. Written by distinguished military historian Donald E. Graves, this is a companion to his South Albertas, regarded by many as the best Canadian regimental history ever published. This book tells the epic tale of these soldiers from Western Canada who have carved out an impressive combat record. Although it was officially authorized in 1905, the South Alberta Light Horse traces its origins back to the 1880s when units of cavalry were raised in Western Canada to protect Alberta during the North West Rebellion. Ride with the Light Horsemen as they attack Vimy Ridge in the First World War and land on the beaches of Normandy and penetrate into the heart of Hitler’s Third Reich in the Second World War. This large-format book was published in the centennial year of the South Alberta Light Horse and of the Province of Alberta. It includes more than 500 illustrations, not only photographs, maps and vehicle drawings, but also commissioned uniform paintings by well known artist Ron Volstad. Donald E. Graves, one of Canada’s best known military historians, is the author, co-author or editor of more than 15 books dealing primarily with the Napoleonic period, including the War of 1812, and the Second World War. Click here to visit his website for information on all his books.